Here is an email from the political arm of the Ravi Bhalla Administration. It is a recap of Ravi's first two weeks in office and is republished here. It went out to a number of Hoboken residents on the Mayor's email list but not everyone. Regardless of your support level for this Mayor there are some articles here worth reading. The content is also telling of a current local politician who is definitely trying to increase his statewide political profile in his first month of office. 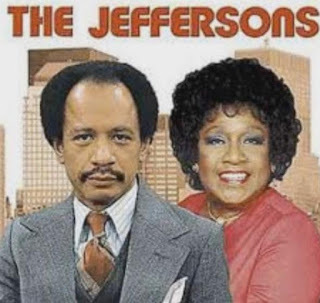 In fact Ravi is a lot like Jefferson, no not Thomas but more like the Jeffersons, like the TV show theme song, "Movin' on up". Ambition and increasing one's political profile are clearly an objective here, whether it is primarily or secondarily, it does not matter. Is Ravi like the Jefferson's? - not exactly but he is certainly trying to move on up. mobile political ambition? For that we will have to wait and see. Hi, and Happy New Year! My name is Theo Siggelakis, Mayor Ravi Bhalla's Finance Director. As 2018 gets underway, I wanted to introduce myself to you and announce a newsletter we hope you will find informative throughout Ravi’s administration as Mayor of the great city of Hoboken, NJ. Once a month, I will be sending out a news summary of Ravi’s work in the office, media statements and appearances, commentary, and other interesting items to keep you up to date on how your support for Ravi also supports tangible action in Hoboken and beyond during his service as Mayor. This is meant to be a convenient, short news roundup - just one small way to thank you for your incredible support for Ravi. As always, feel free to reach out to me or my colleague, Sara Tofighbakhsh, with any questions or feedback. Here’s to four years of strong leadership in Hoboken with Mayor Ravi Bhalla! “It’s not just a new year, it’s the start of new leadership and a historic moment in the city of Hoboken.” NOTE: Contains news video segment of the inauguration ceremony, including comments by NJ Senators Cory Booker and Robert Menendez, Attorney General Nominee Gurbir Grewal, and Mayor Ravi Bhalla. "In a time of darkness, in a time of distress, in a time when there are headlines about the divisions and the divisiveness and the hatred and the bigotry and the ignorance, Hoboken looked around and said, you know what, we're going to find a qualified and competent, compassionate man of integrity," Booker said. "We're going to find someone who leads with love." “I am proud, humbled and honored to be your mayor,” Bhalla said. “I look forward to getting to work on behalf of our residents.” NOTE: Scroll down for a video interview with Ravi about his plans to improve Hoboken as Mayor. Less than two weeks into his first term, the new mayor of Hoboken is locked in a tug of war with the nation's third-largest transit system over a parcel of land on the city's picturesque waterfront. "The Hoboken waterfront is the crown jewel of the State of New Jersey," said Mayor Ravi Bhalla. "People from all over the world come to our city to enjoy the waterfront and the breathtaking views that it offers." Referring to Gov. Christie Christie's departure from office on Jan. 20, Bhalla criticized the plan by the transit agency he controls as being "rushed at the 11th hour of an outgoing administration." When Hoboken Mayor Ravinder Bhalla learned that NJ Transit rescheduled a much-anticipated board meeting from Friday to Monday – Martin Luther King Jr. Day – he had one word for the decision: "disgraceful." In his first executive order, new Mayor Ravi Bhalla declared Hoboken “a fair and welcoming city” as many city officials and advocates applauded the action earlier this afternoon. “The Hoboken we know and love was built by immigrants and today is sustained by immigrants. Many of the immigrants who found a home in Hoboken sailed past Lady Liberty and her poem welcoming ‘your tired, your poor, Your huddled masses yearning to breathe free,’” Bhalla said at the presser held inside the mayor’s office. Bhalla signed the order today surrounded by local officials, including Hoboken Police Chief Ken Ferrante, who will issue a police directive to implement the policies set forth in the order. Amol Sinha, executive director of the New Jersey chapter of the American Civil Liberties Union, told The Jersey Journal it is "extremely significant" that Bhalla's executive order is his first action as mayor. "It allows Hoboken to live up to its potential of being a truly welcoming city," Sinha said. "This is not what Hoboken's about," Bhalla told NJ Advance Media in an interview Monday. "This is not consistent with our reputation as a growing, family-friendly city." Bhalla added that it was unfair to Hoboken taxpayers and police officers to be burdened and physically assaulted by a largely out-of-town crowd encouraged to drink heavily.